Most of us have to deal with file size limitation of one type or the other sometime. e.g. restriction in file size of attachments in email, restrictions in file size of uploads on file hosting services, or restriction of file size on your portable device or drive. These restriction often result in problems for us and we need something which can be used to split the files whether they are big or small in smaller parts so that it bypasses the restriction we are faced with. Also, we need some way to join those splitted files back to a single file once its downloaded again. HJSplit is such a small and wonderful utility which can be used to break files into smaller files and then can join them back again to original file without losing any data. It is a standalone application which means you need not install thisÂ on your system to use it. If you want to split a file of whatever size , just click the split button. It will ask you details like the file size of the smaller files which you want the bigger files to break into. After you provide that information and choose the file to split, it starts working. Depending on the original file size , the process can take from few seconds to few minutes. Files are splitted and saved in the same directory as the original file directory. 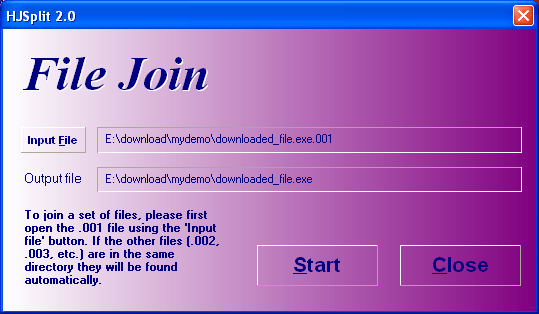 To join a file you just need to select join button and then browse to the first splitted file normally named as .001. If all other files are in same directory, all the relevant small files will be joined to get the original big file as output. Apart from splitting and joining files, it can even compare two files and tell you if the two files are identical or different. I have used it for quite sometime and it performs it job quite well without any problems. This program can also handle files which are larger than 10Gb. This application is very small in size , just 344 KB and hence no problems if you want to carry it over anywhere or store it even on your smallest portable device with little space left. Give it a try if you need to split any file small or large.